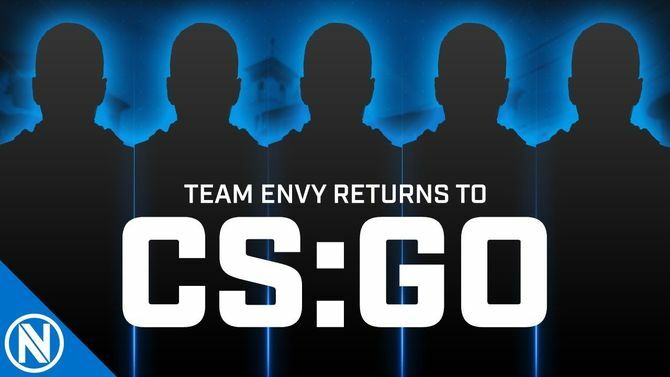 Team Envy has announced its return to Counter-Strike: Global Offensive, signing a North American roster and acquiring the final spot in ESL Pro League Season 8. North America. They've picked up the core of the former Splyce squad, as well as a couple of well-known players. We’re excited to bring a talented roster of Counter-Strike players together to write the next chapter in Envy CS:GO history. Our priority was to sign a roster that would compete at the highest level and give our loyal fans a team to cheer on. Team Envy first entered CS:GO in 2015, and became known for having a strong European roster — more specifically, a French roster. However, earlier this year, they dropped Vincent "Happy" Cervoni, Cedric "RpK" Guipouy, Adil "ScreaM" Benrlitom, Fabien "kioShiMa" Fiey, and Ali "hAdji" Hainouss. The new-look Team Envy will debut in the ESL Pro League Season 8 on Oct. 5th, where they will face off against Team Liquid.